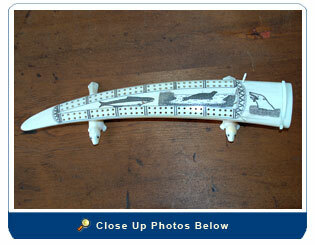 Cribbage was a favorite sailors card game. 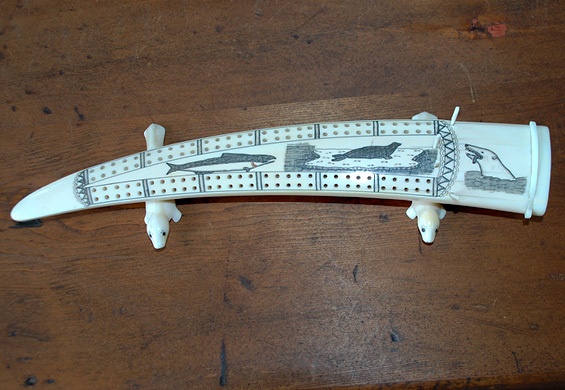 A "cribbage board" was designed with moveable pegs to keep the player's score. An Alaskan Inuit Indian probably made this walrus tusk piece of art. This is an antique, one of a kind item and a rare find because the scrim work is of "museum quality" and is estimated to have taken a hundred hours or more to create. The piece is probably from the 30s to 40s and is made from a walrus tusk. Note the clever scrimshandler fashioned the end piece in the shape of a fish (this compartment is to hold the pegs). Size: 11.5" long by 2.5" at widest end.